This post contains affiliate or commission links which may support the Friendship Bread Kitchen if you click or buy. Thanks for being in the Kitchen with me! Mornings just got a whole lot better. This Amish Friendship Bread recipe for cinnamon rolls was submitted by Kitchen Friend Wai Chan of Williams Lake, BC Canada. Nurse by day and home baker by night, Wai also came up with this and this. Who knew one cup of starter could do so much? 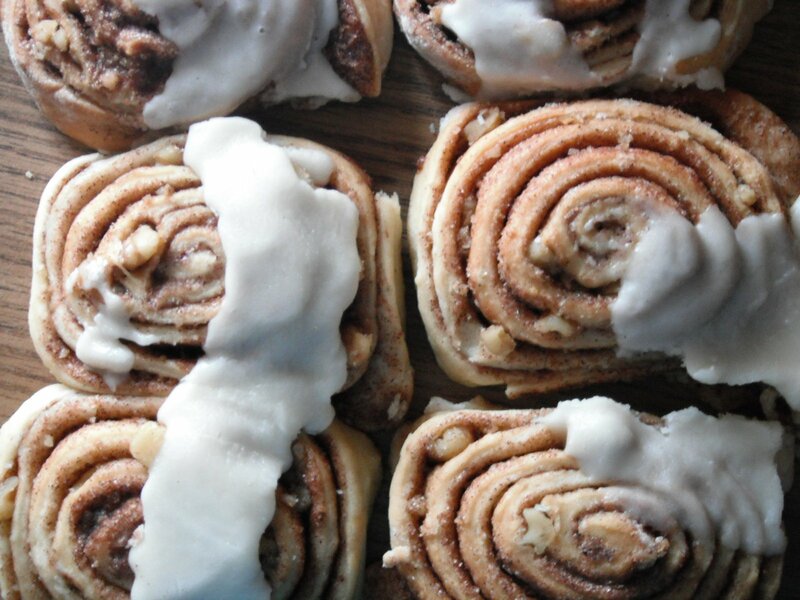 Lots of people, including Kitchen Friends Heather Preuss, Susan Hunter-Whalen and Kimberly Kozicki, each of whom came up with an cinnamon roll adaptation on their own and share their recipes below. Kimberly also came up with this gorgeous salted caramel Bundt cake, and has a beautiful shot of some White Chocolate Raspberry Amish Friendship Bread here. Combine the dough ingredients: starter, flour and milk. Set aside at room temperature for 10-12 hours, or overnight. Stir then add the remaining dough ingredients (excluding the butter) and mix well. Pour dough out onto a well-floured work surface. Knead until dough is no longer sticky, adding up to an additional cup of flour. Roll dough into a rectangular shape ½-inch in thickness. In a small bowl, combine together the ingredients for the cinnamon mixture. Lightly brush softened butter over the surface of the dough and sprinkle on the cinnamon mixture. Roll up dough and pinch to seal the seam. Cut into 1-inch slices. Place on a well-greased cookie sheet and let rest for 30 minutes. Bake in a preheated 350° F (176° C) oven for 30-35 minutes. In a medium-sized bowl, beat frosting ingredients until smooth. 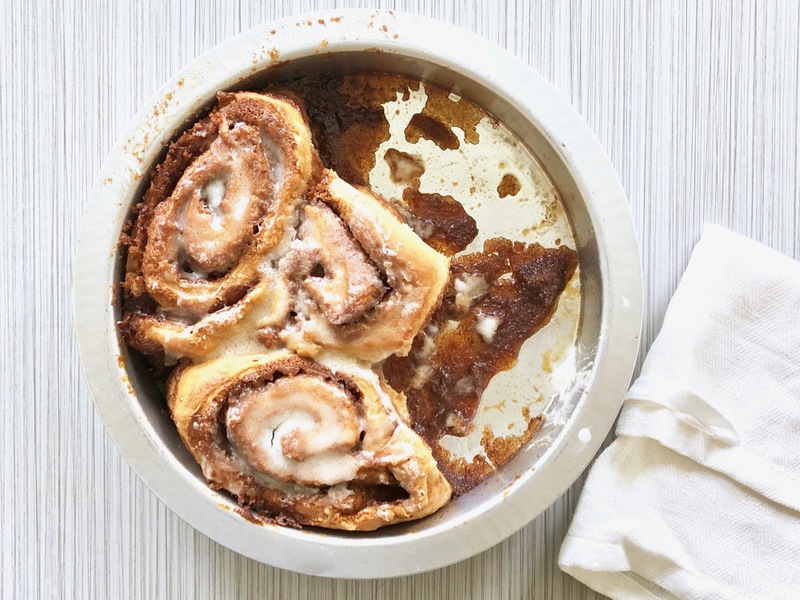 Spread frosting over warm cinnamon rolls. From Kimberly Kozicki: "I used my stand mixer to put the dough together. I put all the dry ingredients into the mixer bowl, added the wet ingredients, then used the dough hook. I let the mixer run for 4 to 7 minutes, at medium speed, and the dough came out perfectly!" 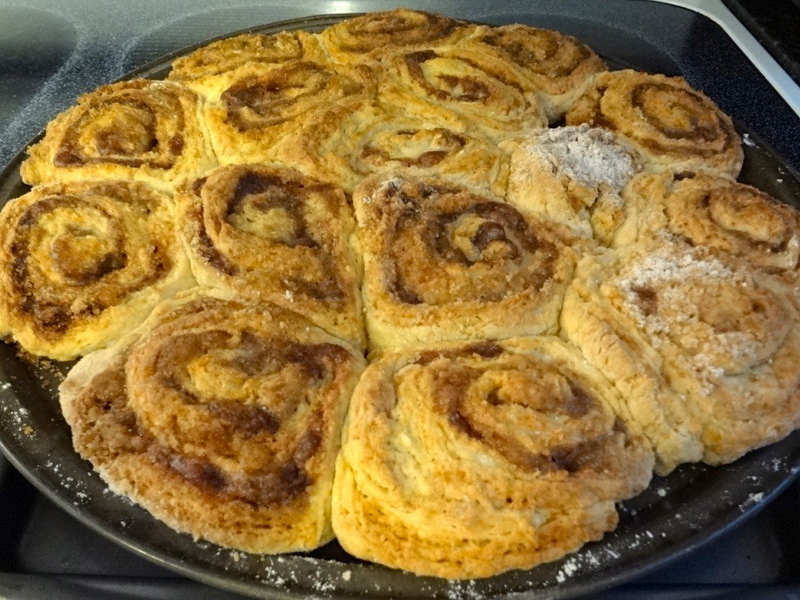 >> Have an Amish Friendship Bread Cinnamon Roll variation of your own? Submit the recipe and share your best pic with us, or leave a comment below and let us know how it worked for you. Hi Helen! If you don’t keep a running starter (some that’s always on hand), then on Day 10, AFTER you add 1 cup milk, 1 cup sugar, and 1 cup flour and mix it together, then put 1 cup each into Ziploc baggies to give to friends, whatever is left over for you to bake with (usually much more than 1 cup!) is what you would use. So you can scoop out a cup of your remaining starter for this recipe, and if you still have some left over, you can leave that in the bowl and feed it again on Day 6 and then again on Day 10 (stirring everyday! ), and then start all over again. You can also just store the leftover starter (in a Ziplock if it’s easier) and bake with it whenever you want — you don’t have to keep sharing it every 10 days. After the first 10 days you can bake with your starter at any time, just don’t forget to feed it about once a week! I have seen instructions for either way; feeding 1 cup of each on days six and ten – or 1 1/2 cups of each. I generally do the 1 cup of each since that’s what I originally learned – plus, I don’t have AS MUCH at the end. But, if I plan to do a lot of baking or have friends asking for it, I do more. I’ve never really tried the “no counting days” method of just feeding and going with it. Maybe I should try that next time around. Those look divine!!!! I really need to get some starter started. I haven’t had Amish Friendship Bread since I was in my 20’s. A friend shared your website and I just started a “starter” today. I can’t wait to begin baking. I’m baking these right now…they look so pretty. It’s my first time ever making cinnamon rolls. I do love experimenting with the friendship bread starter. I’ve been keeping mine in a glass jar and just stirring it with a wooden spoon. I just finished eating one of these & it was amazing! I added 1 1/2 cups of flour to the dough after 24 hours (it took a long, patient while to rise) along with the balance of the dough ingredients. Then put it back into the bowl to rise (kinda) another 8 hours. I rolled it out this morning & let it sit in the pan for 2 hours before baking. I make a caramel sauce for the bottom of one pan (added walnuts too), and left the other pan bare. It took about 35 minutes and was worth all the time & effort! I would like to know, can Splenda be substituted for real sugar in the starter. Cinnamon Rolls are in the ‘planning stage’ for tomorrow. Tomorrow night, we feast like kings and queens. I didn’t read all of the instructions (I know) before I started making these. Consequently I added all of the ingredients into my bowl instead of only adding the first few and then waiting for it to rise for 12 hours. Anyway I decided to just see if it would rise over night with everything in there – including the extra flour. It did and very nicely too. In the morning, I rolled the dough into cinnamon rolls and let them rise again for a couple of hours in an oven that had been preheated to 175 and then turned off. They turned out perfectly! So another option, just in case you’re like me and didn’t read ahead. I had to add a bunch of flour to the dough. They ended up pretty good when fished. I’m going to make up the rolls then put them in the freezer till i need them! I can’t wait to try this recipe. I have always made loaves. Thanks for sharing. My Daughter loves Cinnamon rolls. Store bought ones have so much junk in them, I can’t wait to try these out. They look great and best of all I will know everything in them. I WAS WONDERING IF I COULD MAKE THESE SMALLER, TO MAKE MORE OF THEM? IF SO, HOW LONG SHOULD I BAKE THEM?? I didn’t have Friendship Bread Starter so used my regular sourdough starter. I too had to add an extra 1 c of flour but I thought the dough was supposed to be sticky so left it like that. I just used a table scraper and a large spatula to roll the dough once I placed the filling on it. As to the filling, I HAD to mess with it because I didn’t have anything to frost the rolls. I added a 1/2 tsp each of grd cloves, allspice and nutmeg plus 1/8 tsp of salt to half cup of brown sugar. Ended up using almost 3/4 c of it. They turned out deformed because the dough was SO wet but what did I know?! 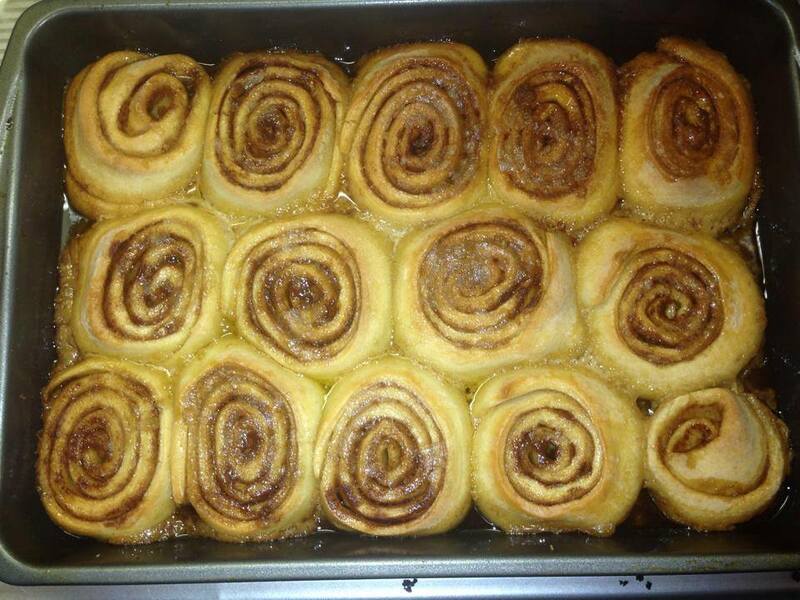 I’d never made cinny rolls before! But they came out amazing!! I used almost an entire cube of butter because I’d used so much “stuff” for the batter but the bread was tender, the filling was tasty so there was no need for frosting and the craisins I added last minute were a REALLY great idea after all. I know I totally changed the recipe but truly, without your recipe, mine wouldn’t have had a chance!! Thank you, from the bottom of my baking dish!! ??? My daughters and I recently tried this recipe, since we always have the friendship starter on hand. These were the best cinnamon rolls we have ever had. We definitely will make these over and over again. Thanks for the recipe. I will make this recipe for my mother and my step-mother Christmas morning before we open gifts. I love making these! They come up beautifully, and they taste perfect. Much better than canned. I love making these for my husband and my two daughters! 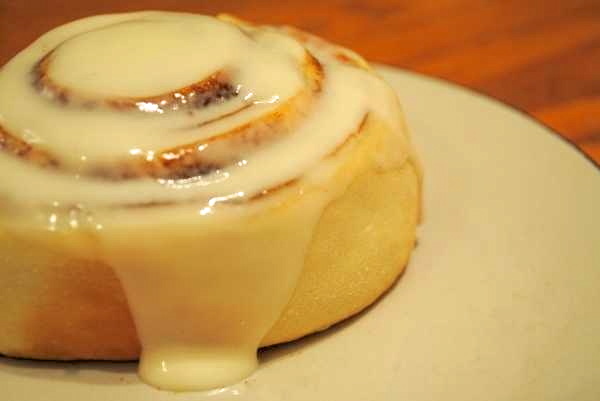 Who doesn’t love a great cinnamon roll. I’m going to make these for my grandchildren, Josh, Lexi and Ethan. I am going to make for my two aunts who love to bake but are limited on what they can do now. They will be so excited to receive a goody baked from someone else. These rolls sound amazing! I would love to make these for my husband and kids. And my mom too! I have some Amish Friendship bread starters, and I am so glad that I found your website! I can’t wait to make these cinnamon rolls for my family on Christmas morning and for my Grandmother, (we call her Meemaw) who is currently in a nursing home. These sound delicious. I would love to cook them for Christmas morning! Thanks for pointing that out, Lori — I’ll go ahead and change it so it’s more clear. Thank you! Yum! These look like they would melt in my mouth. I would definitely make these for Mother’s Day. Yum! We love cinnamon rolls and I make them every time we go camping! I’m going to have try these. These look delicious!! I’m definitely going to make these! These look fabulous! I love making cinnamon rolls for special breakfasts. I’m new to the baking bread and letting it rise overnight thing. what kind of flour do you use? Will All purpose work or should it be self rising?